Russia’s Arena Moscow Club recently celebrated the 20th anniversary of the Russiona Internet—and the first registered domain name—with an extravagant concert event featuring an array of famous musical groups and musicians, such as Lyapis Troubetzkoy, Vasya Oblomov, Smyslovye Galljucinacii, Bravo, and Samsara. The event also marked the first official live performance of MAC Quantum Wash in Russia. 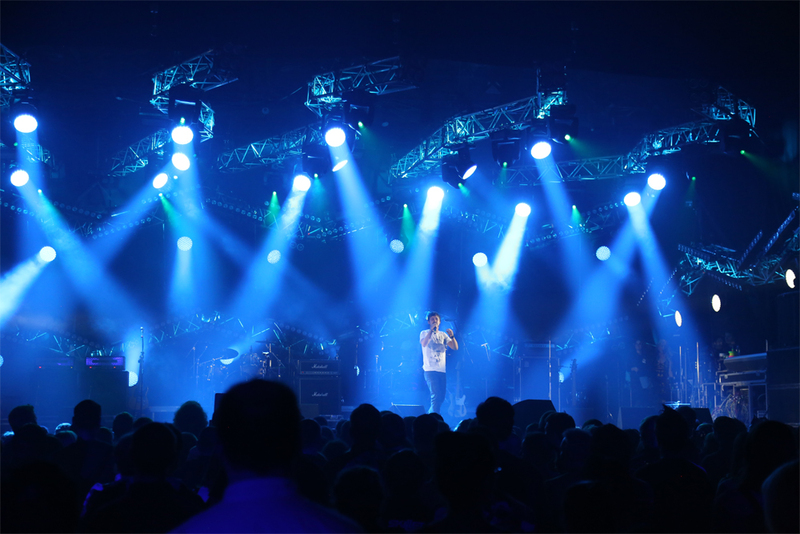 Russian rental company Laser-Kinetics provided the lighting system. The lighting design featured 37 MAC Quantum Wash lights that were placed on the web of trusses to provide the main wash effect with wide, powerful and bright beams, and to create decorative effects throughout the show. Twelve of Martin’s MAC Viper Profiles were also hung on the background and worked in tandem with 20 Martin MAC 700 fixtures that were placed on the top trusses to add flashes of energy to the concert and create bright mid-air effects. Additionally, the lighting designer installed 12 MAC 301 Wash lights on the side trusses above the dance floor for backlight and deployed 16 Atomic 3000 DMX strobe lights. The Moscow Arena has a quiet ascetic design with no screens, scenery or any construction. Specialists from Laser-Kinetics, together with Lighting Designer Alexander Bel’kov and the production company, Art Koleso, decided to make lighting design the focus for this event. The creative design concept was based on the traditional Internet symbol – the web. Highlighted truss structures were placed in the corresponding geometrical order, and a set of Martin lighting fixtures created an additional bright entourage with the new MAC Quantum Wash led movingheads. The MAC Quantum Wash features tight beams, beautiful wash fields, a market-leading color palette, and uniform mixing that combines to accommodate the most demanding applications offering brightness and perfection. By combining an impressive 750-watts of RGBW LED power with Martin’s market leading optical system, the MAC Quantum Wash’s 1:6 zoom is guaranteed to operate with maximum output and ensure superior performance.